A new study into the social media habits of Australians has found that, on average, those aged 14-plus spend about six hours a week perusing the likes of Facebook, Instagram, Twitter, LinkedIn and WhatsApp. However, in a result that will probably shock no one, the Roy Morgan study found that Australian women aged 14-24 were the biggest users of social media, averaging a whopping 822 minutes a week. That’s about 13.7 hours a week or close to two hours a day. While women aged 14-24 spend nearly five hours, or 294 minutes, more time on social media per week than men aged 14-24. The difference is also stark for women aged 25-34 who spend 183 minutes more time on social media per week than men aged 25-34. Commenting on the results, Roy Morgan CEO, Michele Levine, said: “New research from Roy Morgan exploring how Australians engage with different types of social media reveals some interesting insights. 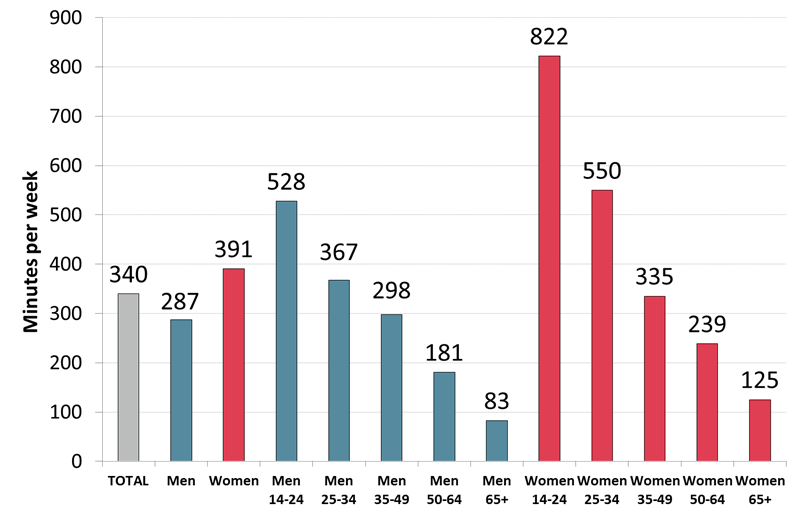 Young women in Australia spend an average of nearly two hours a day on social media compared to just over an hour for similarly aged young men. “Digging into the Roy Morgan data allows in-depth analysis of what characterises a typical user of social media networks including Facebook, LinkedIn, YouTube, Google+, Twitter, Instagram, Tumblr, WhatsApp, MeetUp, Reddit, Google Hangouts, Yahoo7 Messenger & Answers, Skype, WordPress, Flickr, Imgur, Pinterest, Messenger, Snapchat, Viber, WeChat and Yammer,” she said.